So, let me say how much I enjoy this online community of seamstresses and blog readers, and your responses to my crazy posts and random soapbox rambling and the interaction we have as a result. And let me say that I have learned at least as much from you guys as you claim to have learned from me. Like the time when, after sewing all these years, I learned a new way to unpick stitches, which I never knew. And the other time when I repeatedly spelled "catapult" as "catupult" and didn't realize it looked utterly and ridiculously wrong until one of you guys kindly pointed it out. And let me also say that I fear that I sometimes (okay - often) come across as being an insufferable know-it-all simply because I have the disorder known as perfectionism (sometimes called ThePrintMustAlignAtTheSeams-itis and - when I'm more self-aware - stupidism), which is incurable and which gets worse with age. And that, while sharing new techniques and tutorials with you, I fervently, desperately hope that you're never thinking that I'm thinking that my ways are better than your ways of doing stuff, because nothing could be farther from the truth. The truth, incidentally, being this: I'm mentally unsound when it comes to sewing and cardboard and crafting in general, while the vast majority of you (thank heavens) aren't. And let me further say that I am regularly horrified when I write something silly and facetious in a post and am daft enough to forget to actually say so, and folks unwittingly take me seriously as a consequence. What I'm trying to say is I'm soooooooooo sorry if any of you guys felt bad about pinning my monster pouch post after I said it was evil. Of course it isn't evil! And of course you can pin it. And of course I was being an idiot. So, no more jokes-that-only-I-get, okay? Structurally, it's the same concept as the flat zippered pouch from the last post, except we add darts in the last step to give it a 3-dimensional volume. We're also seaming it differently because of the construction process, which you'll hopefully understand later. I'm deliberately omitting the fabric stops to show you what happens without them in a lined, zippered pouch. We'll get to that later. Here is the lining side (zipper's WS). Again, the stitching lines don't extend into the SA region. Next, bring the RS of the lining pieces together, and the RS of the outer pieces together. 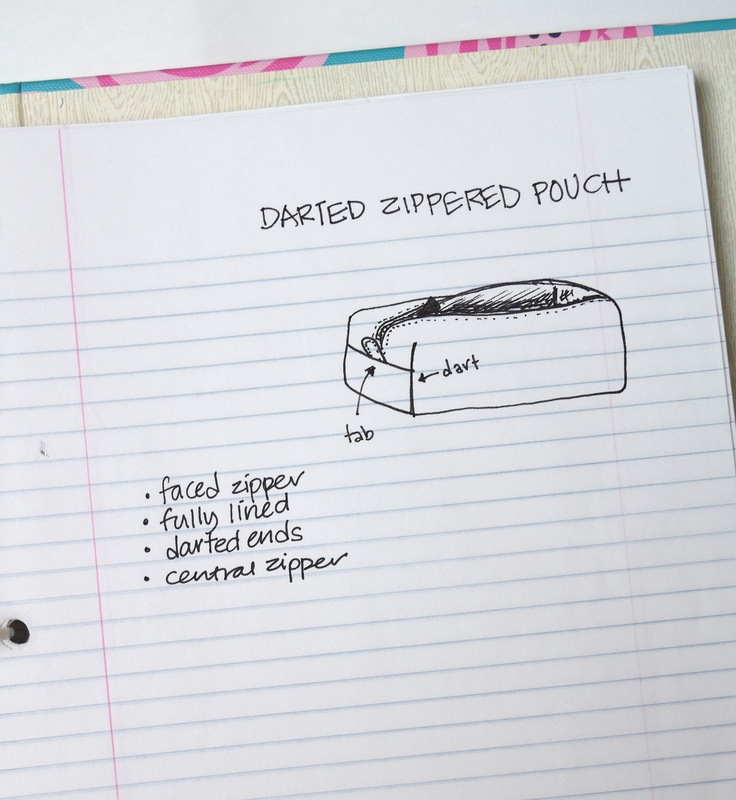 If you've made an edge-zippered pouch before (and we'll be doing that later in this series), you'll be familiar with this configuration. Sew the outer fabric pieces together along their long side. Repeat for the lining pieces, leaving a gap for turning out later. These two stitching lines should extend to the edges of the fabric. 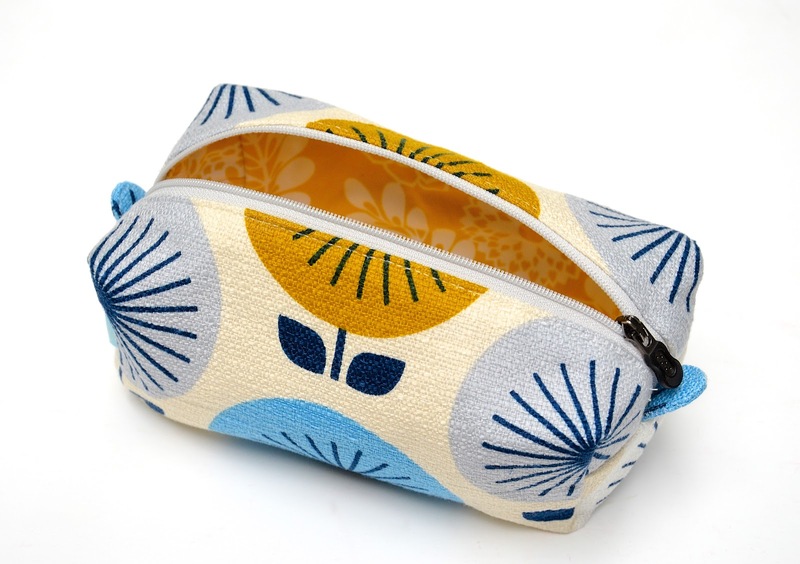 Now, if this were an edge-zippered pouch, you'd sew the short sides up now, turn everything RS out and be done. But that's not what we're making today. So let's move on to the next step. Here's the end view of that configuration. We'll call those two lines you've just stitched "the bottom seams" or "the base seams". The outer and lining layers are joined only at the zipper. 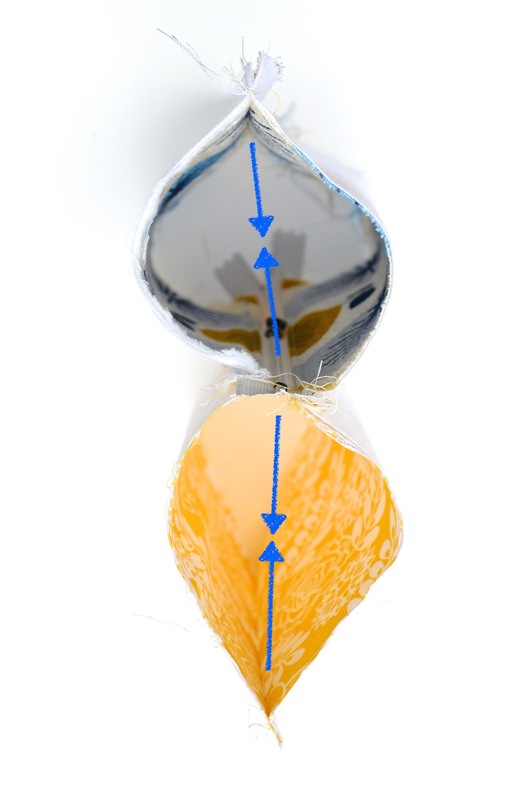 Compress the outer layer as shown by the arrows, bringing its base seam in contact with the zipper. Do the same for the lining layer. 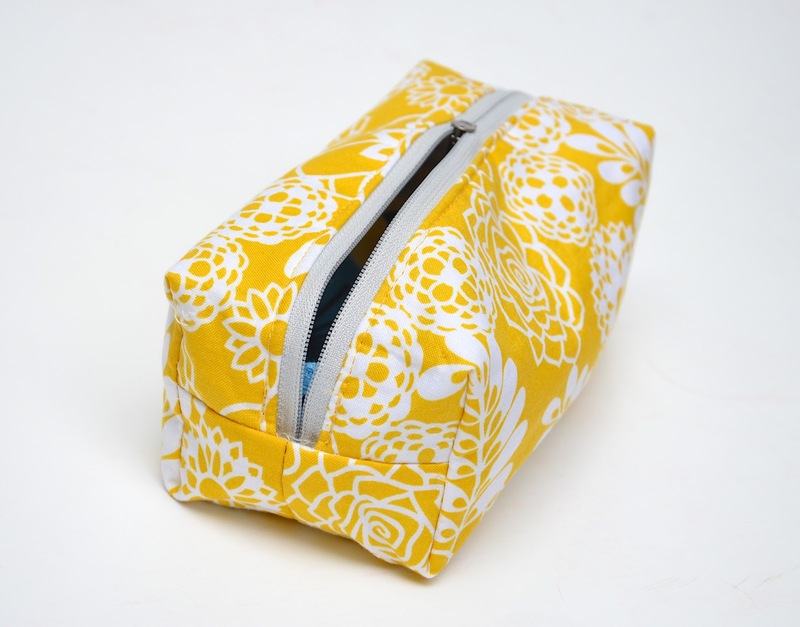 You'll have a flat sandwich of fabric, with the zipper between the outer and lining layers. 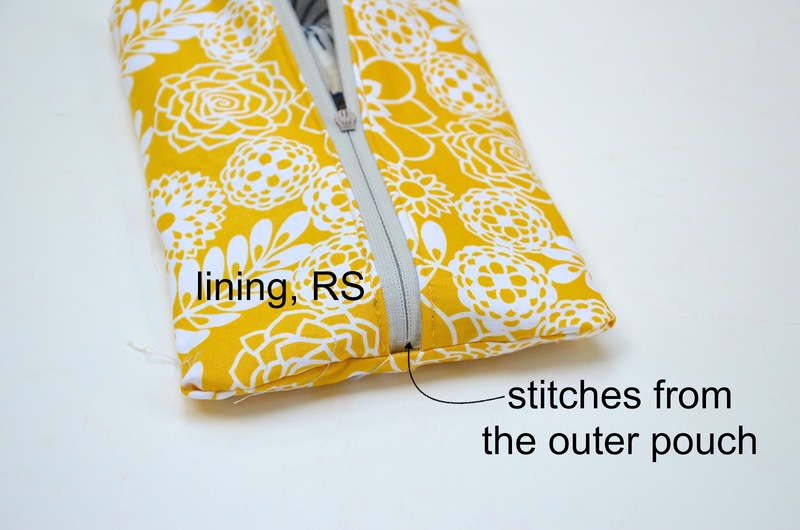 If you want to add zipper tabs, insert them into the short ends of the fabric, pointing inward. but one layer at a time (which we can do because, when installing the zipper, we left the end sSA region unstitched) Here, I've pulled aside the outer layer to sew the lining layer. 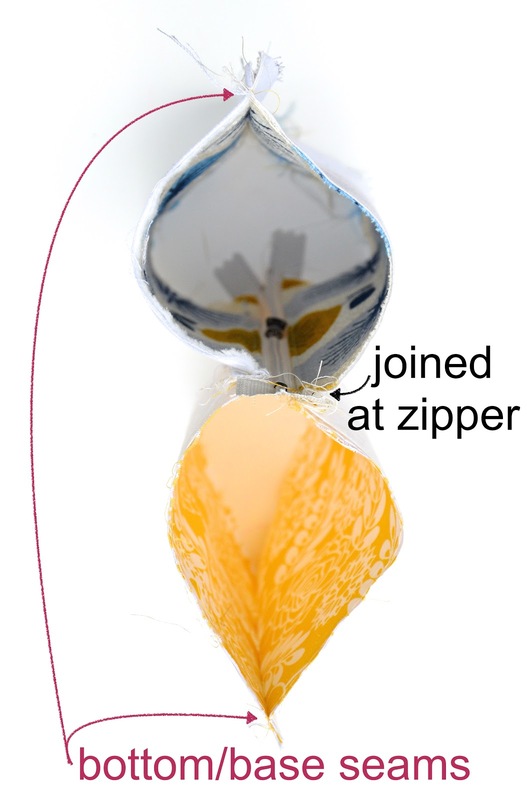 Notice that without any fabric stops, the zipper has to be assigned to either one (or none) of the layers, but not both. In this case, I'm picking the outer fabric layer to sew the zipper end to. We'll see the result of this in a later photo. 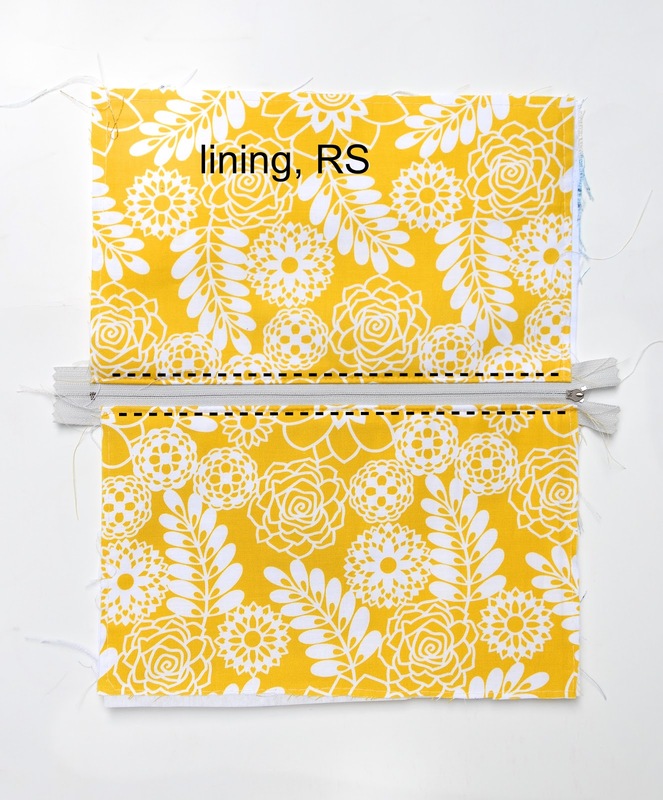 Now turn the entire project RS out through the gap in the lining's base seam. 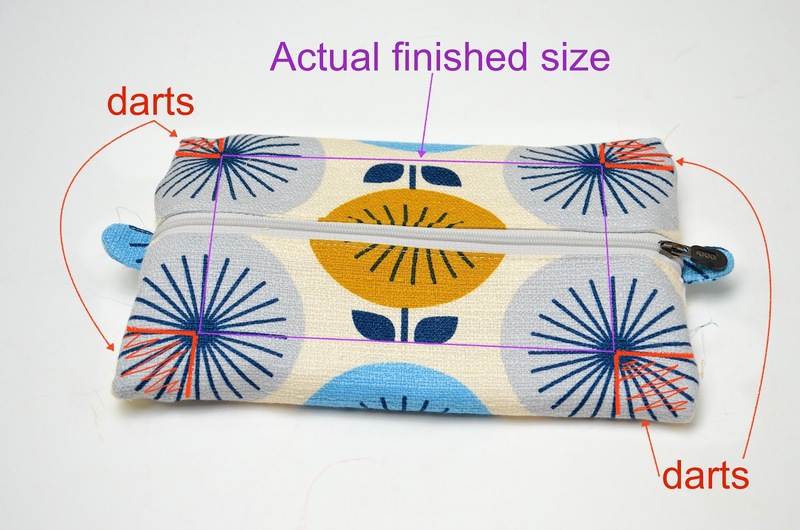 You'll have a large, flat pouch that looks like this, with the two tabs (if you'd added them earlier) sticking out at either end of the zipper. except the seaming is different - today's pouch has a bottom/base seam rather than the seam running all around the edge. 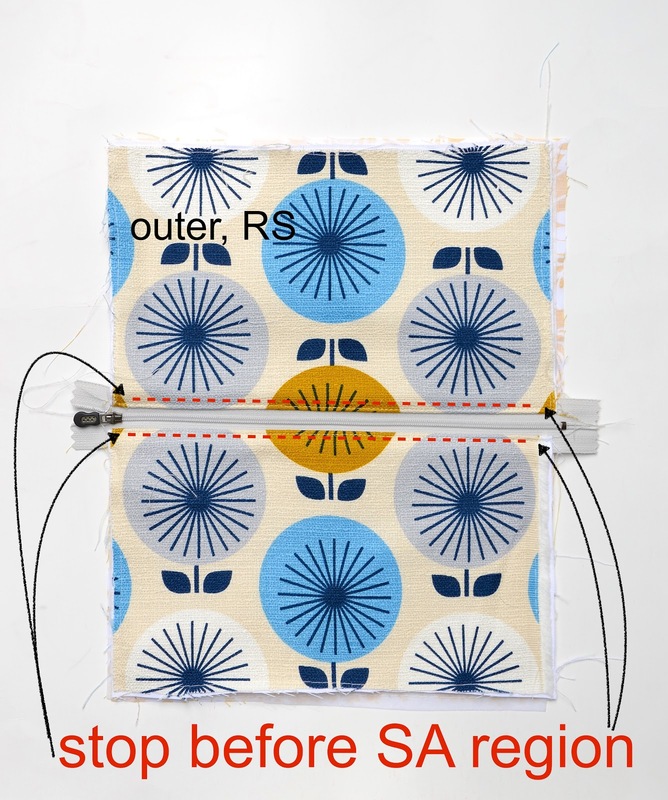 Since we're learning how to line pouches when zippers are involved, let's look at an anti-example to help us understand the role of the fabric stops we so painstakingly added in the last post (but omitted from this one). Remember how we had to assign the ends of the zipper to one layer (the outer layer) when sewing the short edges of the pouch? 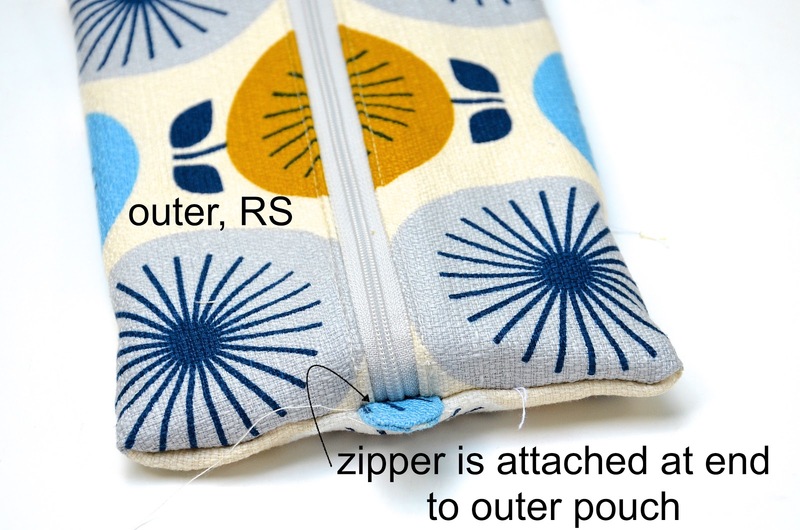 Here is the RS of the outer pouch, showing that end seam, which catches the zipper and tab. 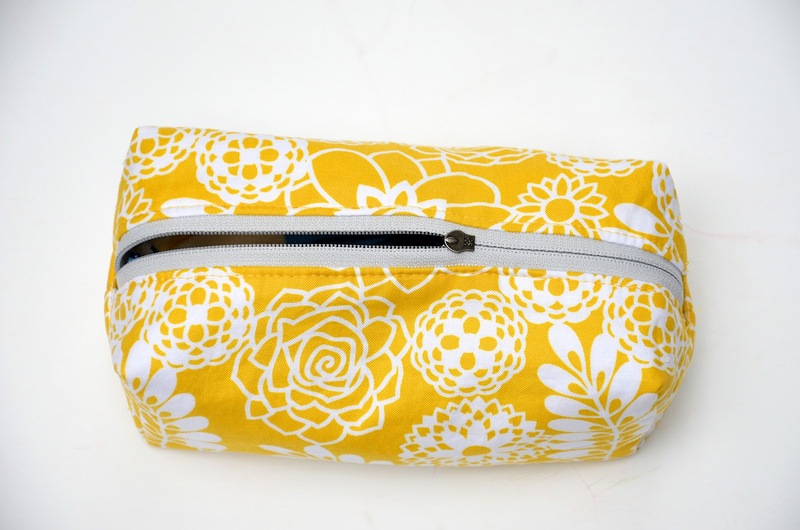 Here is the pouch turned WS out to show you the lining. The end seam of the lining does NOT catch the zipper. Instead, you can see the stitches from the outer pouch's end seam peeking above the unstitched gap in the lining. If we had installed those double-layered fabric stops, we'd have been able to assign one layer each to the outer and lining, and there'd have been no gap. and here is how we will achieve it with four corner darts. with the darts marked, along with the end seam. Let's do those darts now. They're really easy. 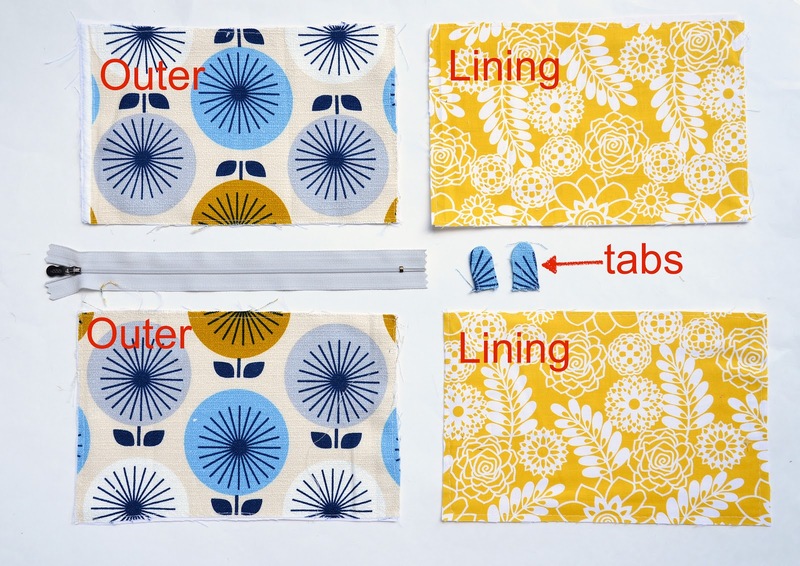 Turn the entire pouch WS out again, and sew vertical corner darts (this tutorial might help you do that). 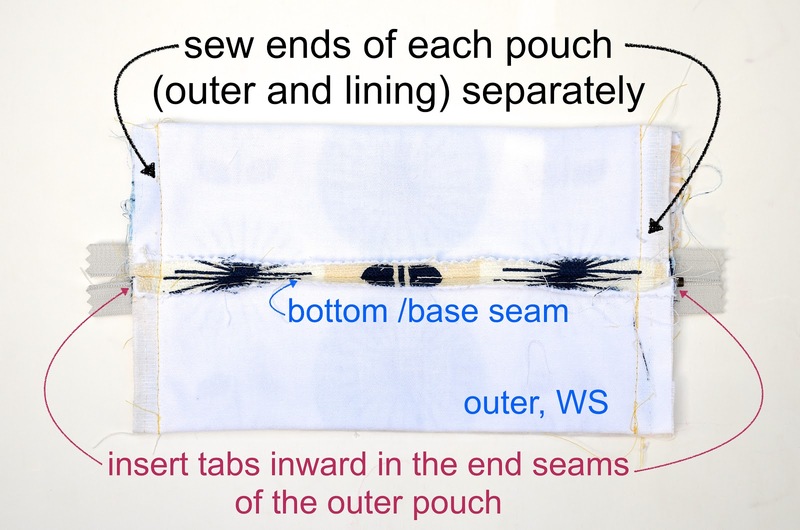 Remember that the two layers - the outer and the lining - of this pouch are connected only at the zipper; everywhere else, they exist as two separate pouches. 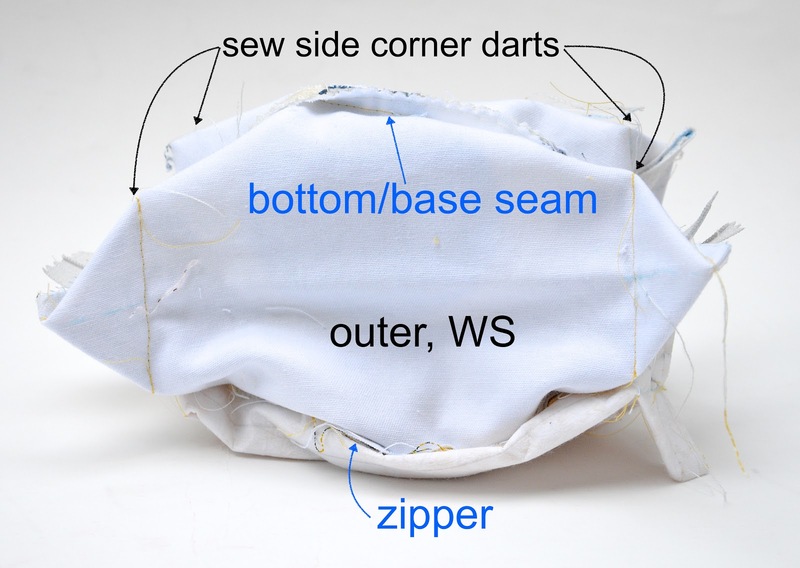 So sew four darts in the outer layer, and four in the lining layer. In this end view, you can see those darts - they're the light blue marker lines. 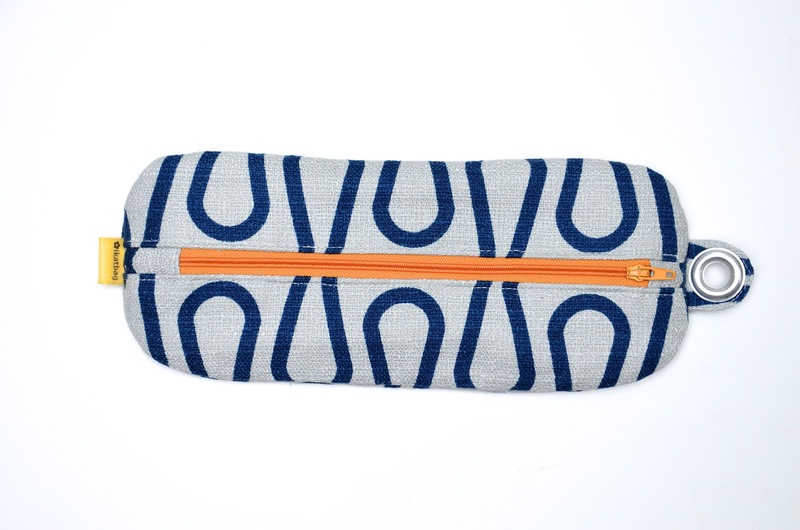 Here is the side view of the pouch, showing those vertical darts on the outer layer (the lining layer is squashed flat underneath). 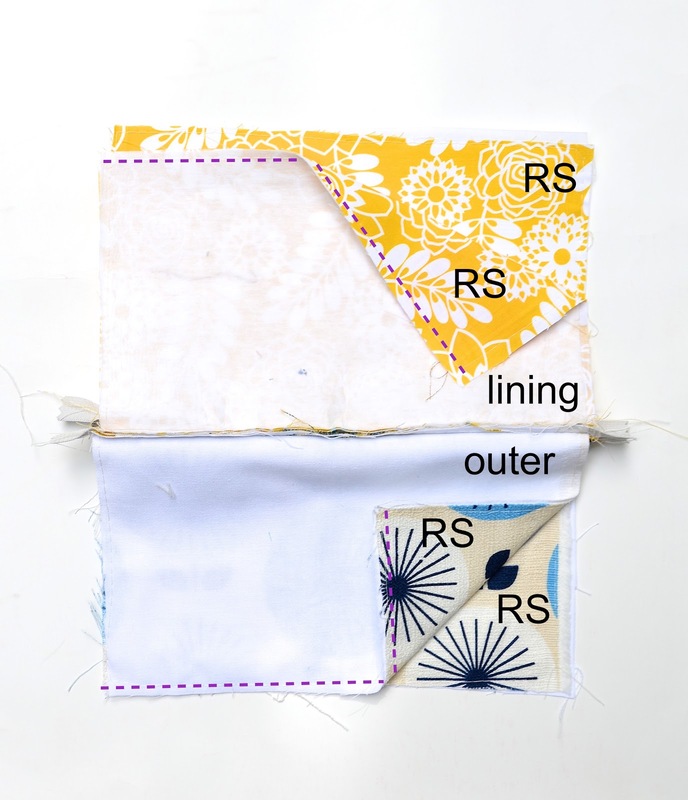 Now trim off those bulky triangular dart corners, turn the pouch RS out through the gap in the lining's base seam, and ladder-stitch that gap shut. 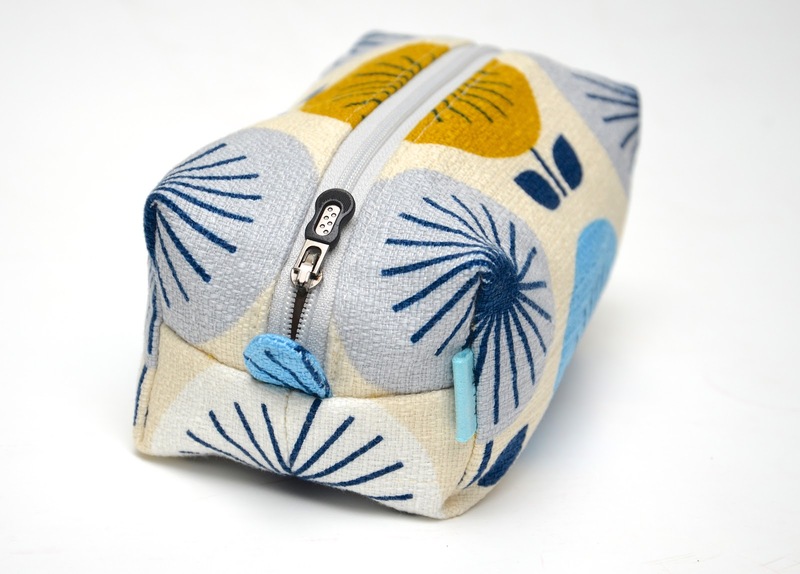 Next up: a boxed pouch, with a side zipper! Thank you so much for doing this tutorial, my 12 year old daughter and I are doing it together and it has been great! Such a learning experience. I started hand sewing when I was a little girl and then taught myself to read and sew from a pattern when I was 19 (before google and youtube). I didn't even learn to use a sewing machine until I was 21. I can make anything from a pattern or by copying an existing garment but your blog has shown me that I can make my own patterns (I learned to make a sloper!) and I love that my daughter and I can learn some new things together. Thanks a lot - now I understand how it works! Great! 2. i rarely shop, as a makerhead, but ALMOST bought a bunch of tiny puches the other day - and then I thought of you and this series. I'm so excited to learn these tricks and thank you for giving me one (hundred) fewer reasons to go to the discount shop. Gah! Some people get a bit overly sensitive, don't they? Don't change how you write at all, I love it. Your blog continues to be my favourite because of the way you write and your very excellent interpretations on sewing, kids, life and all things. Also, I just wanted to say my olddest turns 5 next week and we are having a Bunny party for her on Sunday. I showed her Kate's bunny party page and it was a huge hit. I've spent the last few weeks trying to replicate as much as I can but had to give up with trying to work out the dimensions for the hutches (too hard basket!) and just bought plain white paper gift bags for the girls to decorate instead. I really wanted to thank you for your inspiration and amazing ideas, and hope you don't mind me almost completely copying the whole thing! I don't have a blog so I wont be posting it anywhere as my own. I only wanted to say I am so appreciative of your ideas. Oh, and thanks for this tutorial. It's the first time it has made so much sense to me, and your detail about using the stops really helps. Fantastic tutorial. Really clear. 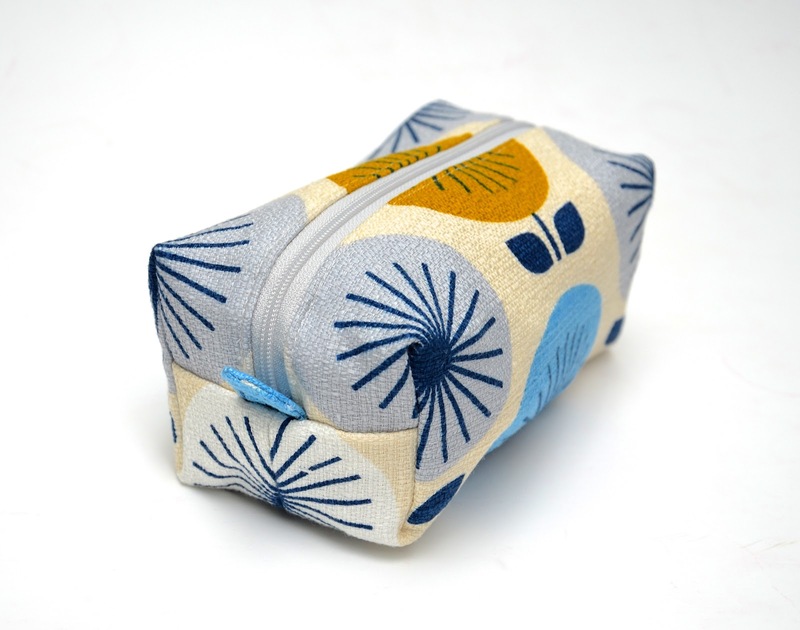 Thank you - I need to make a pencil case for my youngest son and this should be perfect! Thanks for exercising my brain this morning. I am looking forward to the rest of the series! First I'd like to say that we share the same humor, I get your jokes! But more importantly I must thank you from the bottom of my heart for all of your time and sharing. I've never had any formal sewing lessons to speak of so the fact that you're explaining why you do the things you do is extremely helpful. This lesson is marvelous! And yes, I did pin the monster, so that my grandson and I can be inspired to make our own! Thank you so much for these very detailed tutorials! I am loving this series!!! And I have to say that I laughed out loud (for reals) over your little rant in the last post! I am sorry to hear that some people didn't take it as humorous. Keep up the great work!!! I love it ALL! You know that I don't share your perfectionism, but I have to say that the way you lined up the prints for this zippered pouch is stunning. I love your tutorials, all of them. I also love your sense of humor and your willingness to be human in your blog. It is regrettable that you were made to feel bad about something you said. Please hold your head up. You have no reason to be embarrassed or ashamed. Long time listener, first time caller! I'm so happy you are making these zipper tutorials... it's explaining SO MUCH and I just wanted to Thank You!! I loooove that everything is lined! 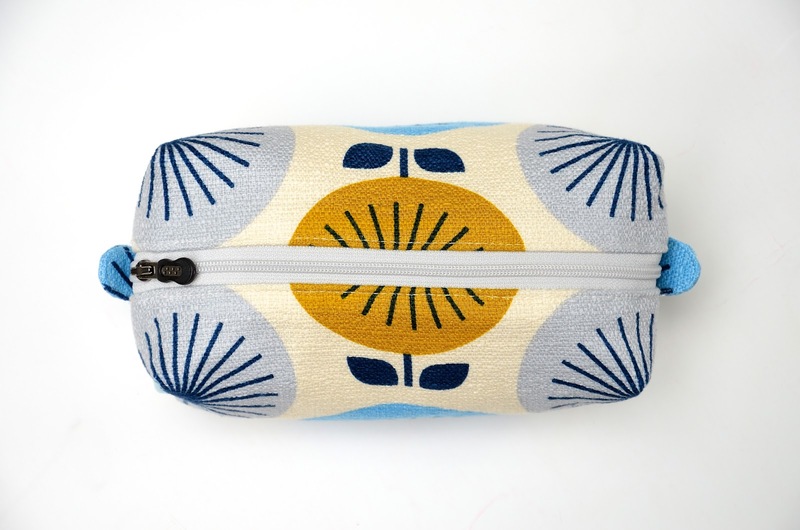 When I first made some bags out of free patterns I found in dark corners on the internet, I enthusiastically followed all directions...and almost cried when I realized that the beautiful pouches were a mess of raw edges inside. And that THAT was why there weren't any pictures of the inside. I like the guts to be finished nicely. THanks for explaining! Thanks a lot for every tutorial you send. With you, I improve my sewing... and my english! Don't change anything... You are a very good teacher... and nearly a friend ! I loved the bag tutorial series, and I'm thinking I'm going to love this one as much. Thank you again for the time you've spent on it. Hi Jenny - you're not the first to ask why I leave the two layers as separate pouches. It's a good question. It's preference, really, especially in these simple pouches. 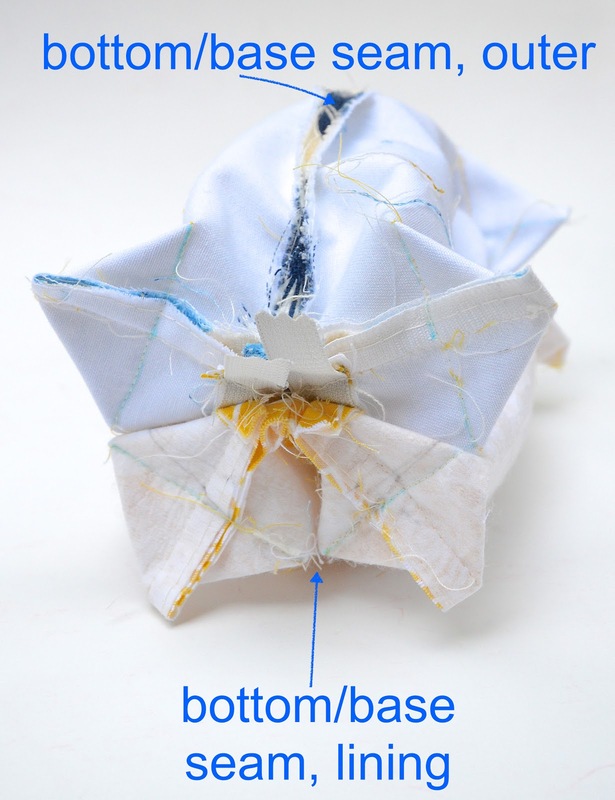 In the more complex bag designs, it isn't an option to sew the seams together in the natural construction sequence (although I have done something similar by stitching the SA of both layers to each other before turning RS out - see below). I prefer to sew the two layers separately because most of my bags (outer and lining) are made in heavy fabric - nylon and duckcloth, plus interfacing and canvas stabilizers. This makes the seams in even a single layer very thick, and sewing the seams of both layers together adds bulk. 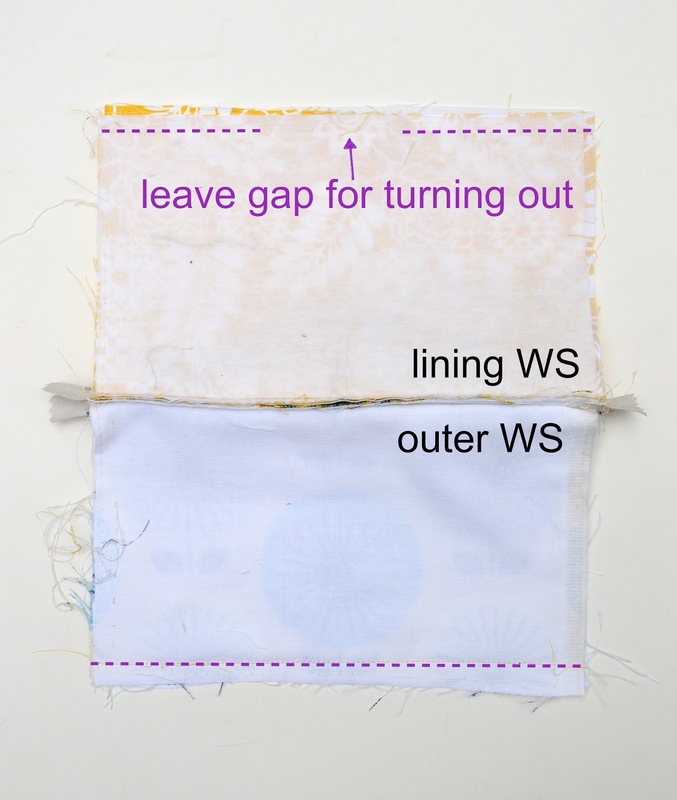 Separately sewing the seams of the two layers allows me to press them flat to lie against each other on their WS. 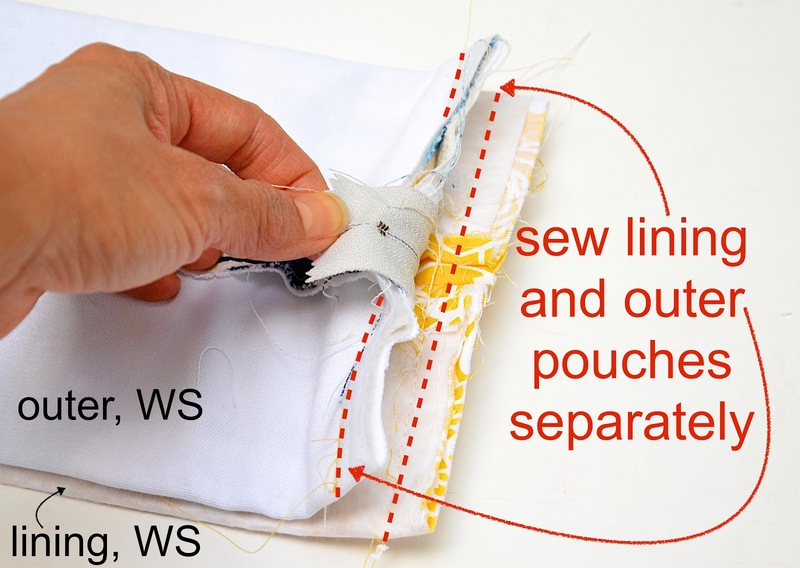 If a lining tends to shift about - as is common with light fabrics without stablizers - I'd stitch the SA together after pressing the seams open and lining them up on the WS. But I don't usually have this issue because my lining layers are pretty stiff and hold their shape. That explains it perfectly-- I've not done much sewing with heavy fabrics, especially for both outer & liner. Can you post a supply list for the zippers. Kind and length. I live rural and need to order all my supplies. It is cheaper if I only have to pay shipping once. I understand that I can size the pouches as I see fit and the size I choose to make the pouch will dictate the size zipper I need. A list would be a great place for me to start.